SERVSquIaCre CEorneSr SIerNviceKSinSks 16 gAugE, 304 STAiNLESS STEEL SERviCE SiNkS wiTh TuBuLAR SuppORTS OR LEgS 12” Bowl Depth (Excludes Knee Valve Units*) • 8 1/2” High Backsplash • 8” O.C. 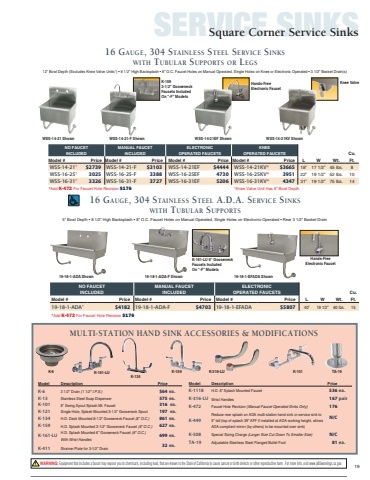 Faucet Holes on Manual Operated, Single Holes on Knee/Toe-Push or Electronic Operated • 3 1/2” Basket Drain(s) Manual Operated (Faucet Not Included) WSS-14-21 Shown       Knee Valve WSS-14-21FV Shown WSS-14-21FV** wiTh TuBuLAR SuppORTS 5” Bowl Depth • 8 1/2” High Backsplash • 8” O.C. Faucet Holes on Manual Operated, Single Holes on Electronic Operated • Rear 3 1/2” Basket Drain WSS-14-21EF Shown WSS-14-21KV Shown Toe-Push Valve Cu. Wt. Ft. 45 lbs. 8      MANUAL FAUCET OPERATED Model # WSS-14-21† WSS-16-25† Price $1779 1964 WSS-14-21EF WSS-16-25EF $2886 3072 WSS-14-21KV* WSS-16-25KV* $2380 2566 $2686 2872 L W 18” 17 1/2” ELECTRONIC OPERATED KNEE OPERATED TOE-PUSH OPERATED     Model # Price Model # Price Model # Price            Manual Operated (Faucet Not Included) WSS-16-25FV** *Knee Valve Unit Has 8” Bowl Depth **Toe-Push Operated Sinks Include Wall Bracket & Are Floor Mounted †Add K-472 For Faucet Hole Revision $115 16 gAugE, 304 STAiNLESS STEEL A.d.A. SERviCE SiNkS 22” 19 1/2” 52 lbs. 10     19-18-1-ADA Shown Model # 19-18-1-ADA† †Add K-472 For Faucet Hole Revision $115 Price $2716 19-18-1-EFADA Shown 19-18-1-EFADA $3771 Hands-Free Electronic Faucet L W 40” 19 1/2” Cu. Wt. Ft. 60 lbs. 15    MANUAL FAUCET OPERATED ELECTRONIC OPERATED   Model # Price       MULTI-STATION HAND SINK ACCESSORIES & MODIFICATIONS  Model Description Price K-6 3 1/2" Drain (1 1/2" I.P.S.) $42 ea. K-13 Stainless Steel Soap Dispenser 373 ea. K-101 8” Swing Spout Splash Mt. Faucet 205 ea. K-121 Single Hole, Splash Mounted 3-1/2” Gooseneck Spout 128 ea. K-159 Splash Mounted 3-1/2” Gooseneck Faucet (8” O.C.) 236 ea. K-411 Strainer Plate for 3-1/2” Drain 21 ea. K-1118 Extra H.D. 8” Splash Mounted Faucet 349 ea. K-316-LU Wrist Handles 109 pair K-472 Faucet Hole Revision (Manual Faucet Operated Sinks Only) 115 K-508 Special Sizing Charge (Larger Size Cut Down To Smaller Size) N/C TA-19 Adjustable Stainless Steel Flanged Bullet Foot 53 ea. FLOOR STANDING LEGS MODIFICATION Converts Wall Mounted WSS, FC-WM, FS-WM & 19-18 Series Sinks To Free Standing Floor Units. • Stainless Steel Legs with Flanged Feet • Welded Side Bracing • Rear Adjustable Cross Bracing    Fits Sink Length Price Model # FS-CB-23 FS-CB-40 FS-CB-60 60” 494 FS-CB-80 80” 593 FS-CB-100 100” 791 FS-CB-120 120” 990    23” $390 40” 396      Rear Cross Bracing should not be installed when adding legs to an ADA Compliant Sink. WARNING: Equipment that includes a faucet may expose you to chemicals, including lead, that are known to the State of California to cause cancer or birth defects or other reproductive harm. For more Info.,visit www.p65warnings.ca.gov. 19       WARNING: Faucets on this page may expose you to chemicals, including lead, that are known to the State of California to cause cancer or birth defects or other reproductive harm. For more Info.,visit www.p65warnings.ca.gov.